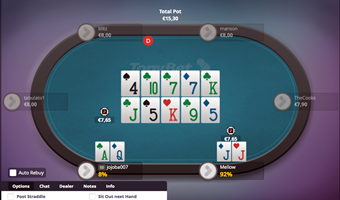 The brand-new poker platform with the poker pro for its head is expected to be available early on the following year. At the moment, there isn’t a lot of information on Galfond’s new venture to be found, but he has declared that Run it Once is aiming to attract a wide variety of poker players – from high-stake professionals to rookies. Meanwhile the young and ambitious poker room TonyBet has often declared that their focus lies on recreational players. This platform is run by people who believe that amateurs must not be fed to the sharks, and this is where the idea for the unique Run it Twice tournaments came from. These tournaments are going to be launched shortly, featuring the function that was previously only available in live cash games. TonyBet is launching daily Run it Twice tournaments in the middle of September 2016, and at the end of the same month, the poker room is introducing a Run it Twice freeroll festival with a guaranteed €15 000 prize pool.